Despite a three year moratorium imposed on pilchard catches by the Ministry of Fisheries and Marine Resources last year, Etosha Fishing has secured employment for all its seasonal workers until at least mid-December this year. Furthermore, the company is in the final stages of securing contracts to can pilchards for the Glenryck SA and Lucky Star for 2019. It’s business as usual at Etosha Fishing’s cannery thanks to its continued imports of frozen pilchards for local processing. 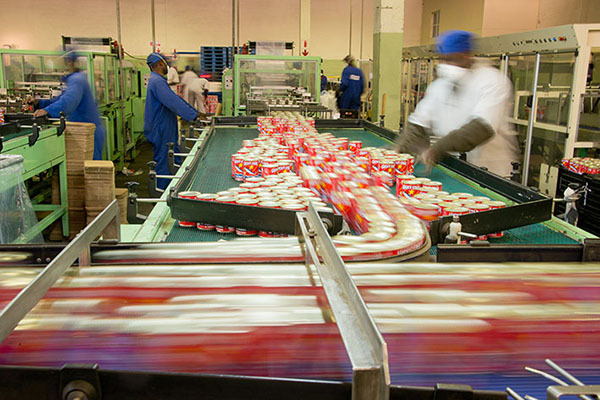 The company has been canning pilchards for the African market leader, Lucky Star Pilchards, since 1999 and have now also secured a contract to can pilchards for the Glenryck brand. “Our cannery has been fully operational since January and we anticipate continuing normal operations for the remainder of the year. I am also confident that we will be operational until the end of 2019,” Etosha Fishing Managing Director Pieter Greeff says. He gives the assurance that all seasonal workers will be employed by the company for the same period as in the past when locally caught pilchards were processed at its land-based factory. 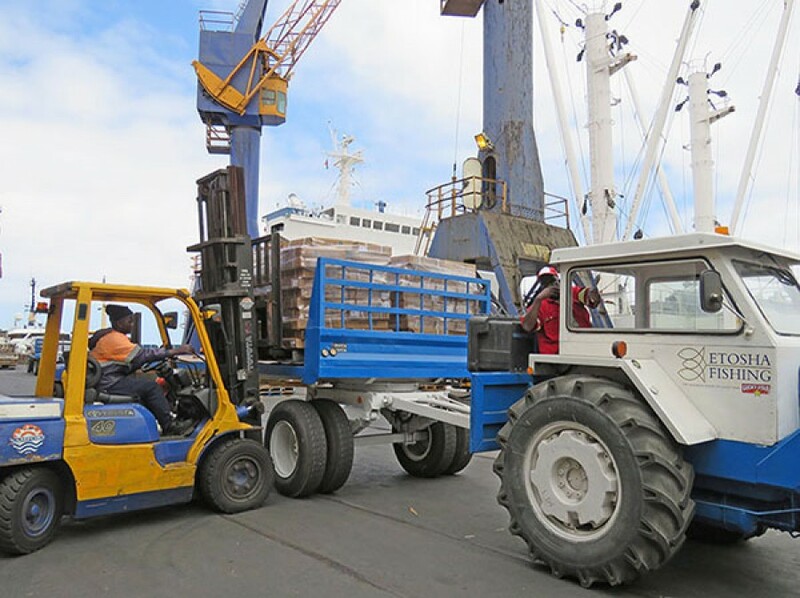 This assurance comes as the first bulk shipment of 3,300 metric tonnes of frozen pilchard was offloaded at the Port of Walvis Bay for processing at Etosha Fishing’s world class cannery last week. In recent weeks the company also concluded and signed this year’s wage agreement with the Namibia Seamen and Allied Workers Union (NASAWU) for all its seasonal land-based employees. “We had to devise various plans and business strategies to ensure that our cannery remains operational, even if it means we only operate at a break-even level. If we had to close down our cannery as a result of the moratorium on pilchard catches, it would spell the end of Namibia’s pilchard industry. Restarting the factory would be too costly,” Greeff explains. He adds that the company fully supports the moratorium which will hopefully allow the country’s pilchard resource time to recover. With Namibia’s pilchard resource under pressure for the past decade now, the company has imported in excess of 50,000metric tons of frozen pilchards for processing on local soil since 2010, which has been sustaining local jobs and continues to serve as a significant boost for the local economy of Walvis Bay. 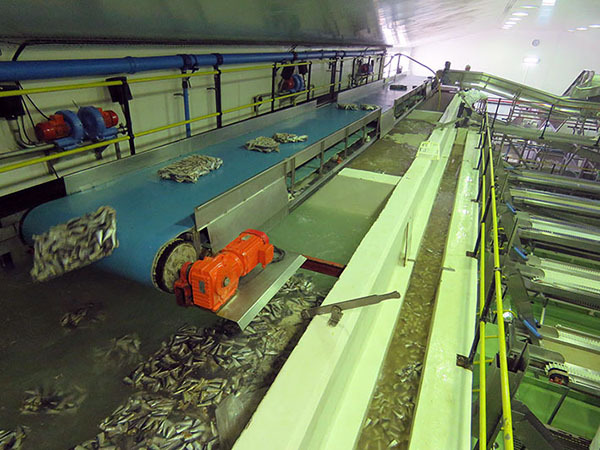 In recent years the company also made substantial investments in thawing equipment in order to process the imported frozen pilchards more efficiently. Etosha Fishing has been canning pilchards for the revered Lucky Star brand since 1999 and last year secured a contract to can pilchards for the Glenryck brand. Despite the demise of Namibia’s pilchard resource over the past decade, Etosha Fishing continued to invest in its cannery to ensure it remains a world-class factory. This thawing equipment allows for more efficient processing of imported frozen pilchard for the local and international markets. In terms of local product innovation, the company broke ground in 2013 with the introduction of Namibia’s first canned horse mackerel product range called EFUTA Maasbanker. It was the first locally canned product to receive the Namibian Standards Institution (NSI) Standard Mark of Conformity product endorsement. The range of products, which includes horse mackerel in tomato sauce, chilli sauce and brine, is Halaal certified and is a proudly Namibian product displaying the Team Namibia logo. It was successfully introduced to the Namibian retail market in 2014 and showed tremendous uptake, with sales increasing from an initial 80,000 trays (960,000 cans) sold in the first year to an estimated 400,000 trays (4.8 million cans) sold annually at present. Etosha Fishing continues to invest heavily in product innovation with the launch of an EFUTA Maasbanker curry flavour imminent and product testing of a minced horse mackerel product also currently under way. Furthermore, Etosha Fishing utilised its own refrigerated seawater trawling vessel for the landing of wet horse mackerel for land-based processing in line with the company’s horse mackerel quota. Planning is under way to build an on-shore facility to freeze horse mackerel not suitable for canning. “Despite the current pressures of a dwindling pelagic resource, Etosha Fishing is determined to remain steadfast in our commitment to sustainable resource management, job creation and industry development,” says Greeff. He notes that the company will also continue to import frozen pilchard in order to remain afloat and will continue to develop and diversify its horse mackerel products.